Editor's Note: This story was originally posted to the PR 20/20 blog on Aug. 29, 2012. For the original, click here. Advances in marketing technology have created both talent and knowledge gaps. Corporate marketing departments and marketing agencies struggle to recruit and retain qualified professionals for career paths that didn’t exist three years ago. In addition,agencies have failed to meet growing demand for integrated services, and to connect their services to measurable outcomes. As a result, it’s become increasingly difficult for marketers to devise and execute integrated marketing strategies; select the right marketing agency partners; allocate time, money and talent; and adapt resources and prioritiesbased on real-time performance. At PR 20/20, we’ve experienced these challenges first hand, and we've become motivated to find more efficient solutions that increase agency productivity and profitability, while creating greater value for clients. It’s time intensive to turn responses into actionable intelligence. High-level personnel are required to analyze responses, and therefore it’s not scalable. 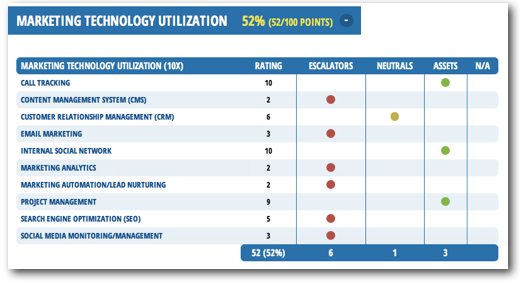 Results lack scoring systems and visualizations that establish benchmarks for performance. The format doesn’t enable a true assessment of business and marketing strengths, and, therefore, success potential. It fails to properly set and align performance expectations. There’s a disconnect from actual marketing campaign strategy and project management systems. The process by which survey inputs are turned into recommendations, including services and pricing, is not transparent to clients. We believe there’s a better way. Our goal is to develop a platform that dramatically improves processes—business development, budgeting, strategy creation and campaign management—and has wide appeal and value to agencies, business owners and marketers. 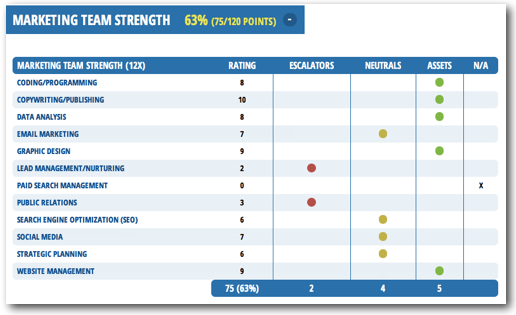 PR 20/20's Marketing Score is a free online tool that assesses the strength of your business and marketing foundations, forecasts potential and aligns expectations. It’s a subjective analysis from the viewpoint of internal stakeholders, including sales/marketing management and company executives. It’s also a marketing intelligence engine that recommends actions to improve your performance. Marketing Score is based on the principle that every element of an organization, as it relates to marketing, can be divided into one of three categories: assets, neutrals and escalators. By evaluating and scoring these elements, organizations can devise integrated marketing strategies; select the right marketing agency partners; allocate time, money and talent; and adapt resources and priorities based on performance. The platform scores more than 130 factors in 10 sections, and takes approximately 10-15 minutes to complete. The ratings are then used to generate automated recommendations, which will become more intelligent and in-depth over time. Recommendation: Break down communications silos, reduce email clutter and improve internal communications. Consider integration of Yammer, an enterprise social network designed to build social-savvy businesses that are more collaborative, efficient and productive. Build integrated marketing strategies that connect actions with key performance indicators (KPIs) and audiences. Determine marketing talent needs and team structure. Forecast marketing agency services costs and marketing team salaries. Match businesses and marketing agencies. Allocate marketing resources—talent, time and money. Adapt resources and priorities based on real-time performance (agile project management). We began rolling out the private beta program in September 2012, and have now moved into public beta. We invite you to come along for the journey. 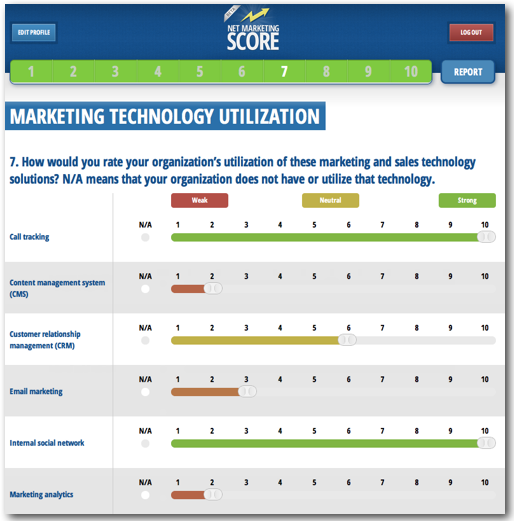 Get your Marketing Score today.